The workings of the heart remain a mystery. It dips and swims with swirling emotion, it aches for what it cannot have, and grieves for what is lost. The heart dreams of better days. The heart is selfish, and can be self-less. We want for ourselves, and wish even more for those we love. Unseen by all but those who know us best, the heart carries scars and patches from battles, the repairs, the mending, the work-arounds. It is resilient. 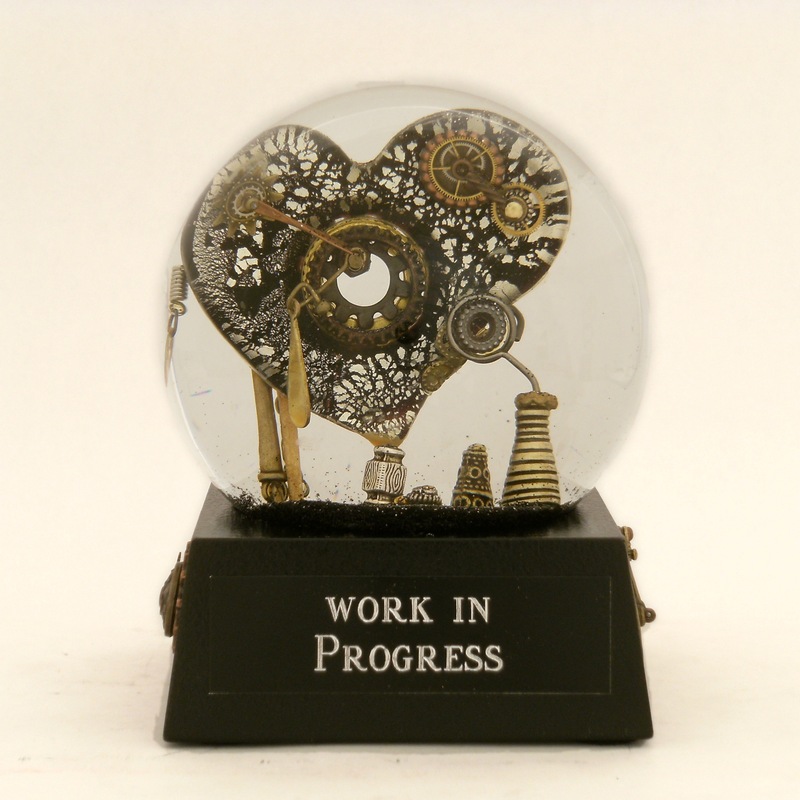 The mythical source of love, emotion, kindness and desire, the heart is always a work in progress. Sometimes I find odd little items and put them in snow globes to make a tiny scene, and sometimes I want to sculpt something specific I’ve imagined. I was working on shaping a small hand, reaching upward, and could not get the index and middle finger to stay the way I wanted. Finally, exasperated, I put the clay piece down. Allright. I didn’t “put it down” — I sort of tossed it toward the foil covered table where I was working. And in one of those moments of serendipity, the fingers crossed themselves. Crossed fingers were unexpected, and not the emotion I was going for, but there they were, waiting in suspense. Do you remember when you kept a secret by saying, “Cross my heart and hope to die?” Or, when you crossed your fingers behind your back and it meant you weren’t really telling the truth, or the whole truth? Or perhaps, you waited for news and closed your eyes and crossed your fingers, wishing it would be good. Please, please, please! I love when my artwork is a mystery to me. It’s not calculated; it leads its own life of ambiguity. The hand said nothing. Is this a promise to be kept, or a promise made with questionable intentions? A few weeks prior, I had found a tiny pair of hammered metal earrings in the shape of hearts. I pulled one apart and placed it in the gentle, eager hand, and folded the ring finger to hold it in place. Now the meaning was clearer: Cross my heart. The Promise. The Promise. 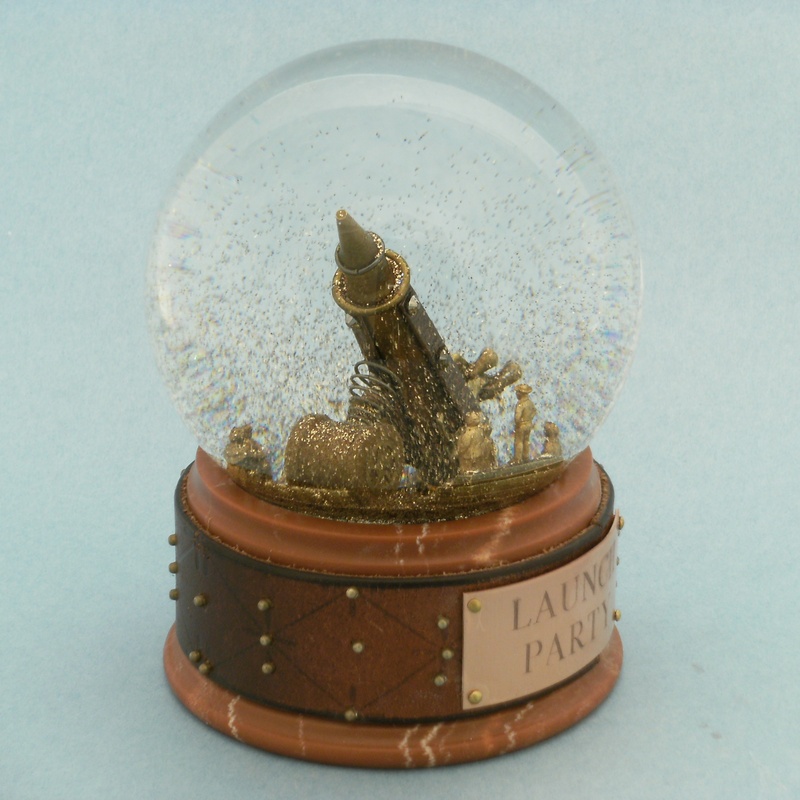 One of a Kind snow globe with sculpted hand, re-purposed antique jewelry and shimmering gold dust in liquid. I’m fascinated with iconic images which hold tight in my imagination. With tiny solid objects that evoke mysterious emotions. This snowless water globe was one of those that I found appealing because of its ambivalence, its ability to be interpreted in so many ways. Two reaching copper hands, one blue heart hovering mid-air. It was simple, but powerful in a way I could not name. Were the hands reaching out to catch a falling heart? Was the elusive heart flying out of reach? Is the heart coming or going? Are the hands ready to comfort, or acknowledging the heart’s new freedom? It called to me, “redemption, hope, caring, freedom, strength.” But I wasn’t certain what this globe was saying. 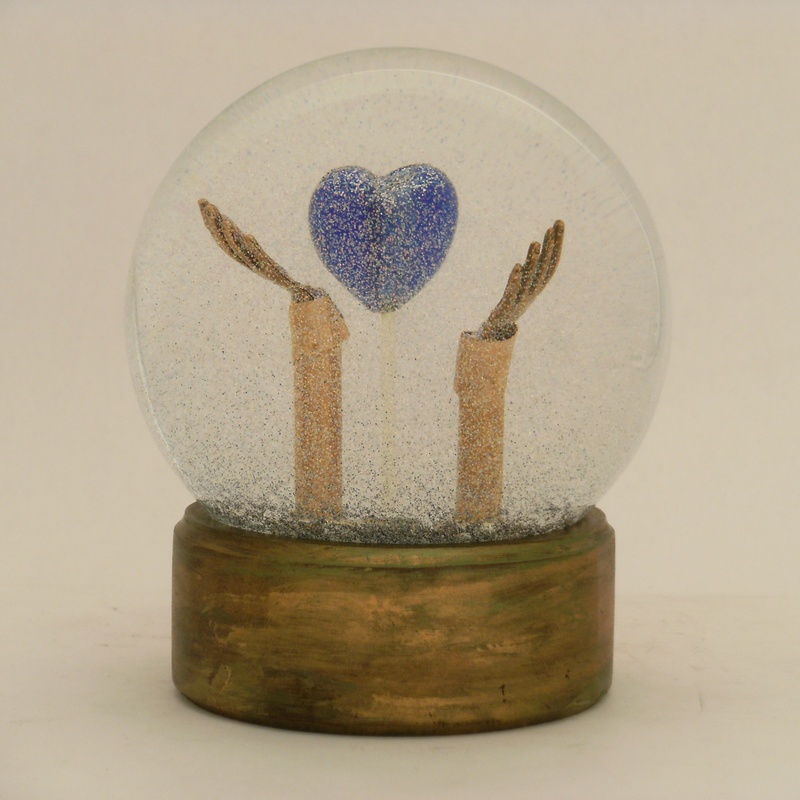 So I called on an army of experts, (my dear friends) and showed them the initial sculpture and wondered which of the many themes captured the dilemma of this fragile blue glass heart. I got quite a few opinions (“Call it Grace, or Love, or Trust,” … and one statement, loud and clear. “The snow globe should be called “Let It Be” and it is mine,” I heard firmly. Of course, I couldn’t argue against the voice of such conviction. So “Let It Be” became the name of this handmade snow globe (with shimmering silver dust instead of snow, because you know: I never use snow.) And so it is. Let It Be.